For those in search of unparalleled, luxury urban living in the middle of the stunning Sonoran Desert, there’s now limited time to live at Optima Kierland’s luxury high-rise condomini­um tower in North Scottsdale. 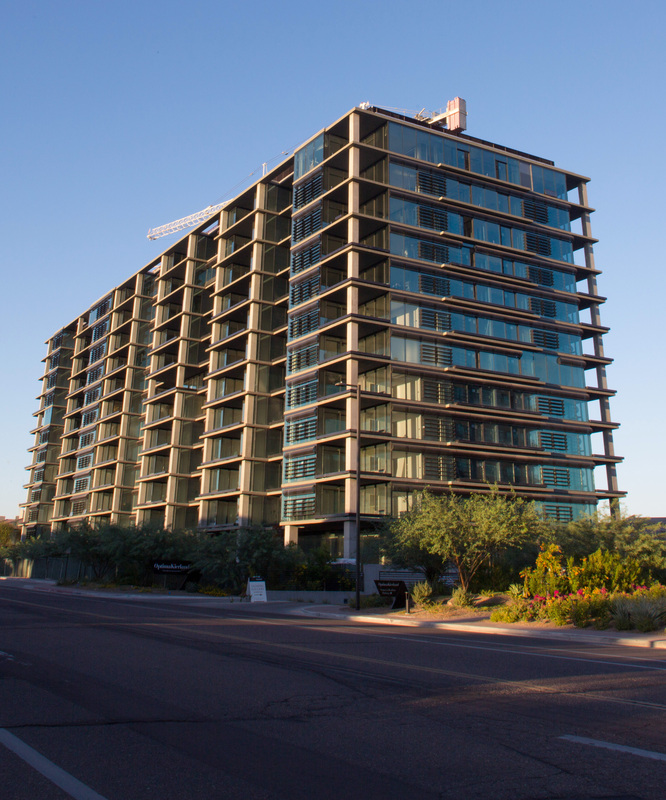 Optima Kierland announced that the condo­miniums at 7120 East Kierland are more than 75 percent sold. With only 55 condominiums remain­ing ranging from approximately 720 to 1709 square feet, prospective residents still have the opportunity to choose from a broad range of one- to three-bed­ room floor plans accommodating various design preferences and lifestyles. Homes are priced from the low $300,000s. The luxury tower was topped off in May 2017; first move-ins are anticipated in early 2018. “We are humbled by the success of Phase I and look forward to our residents enjoying the vibrant, urban lifestyle that Optima Kierland pro­vides,” says award-winning architect David Hovey, Jr., AIA, President of Optima. “This milestone in our development represents one of the last opportunities to own and experience the unique mix of amenities and lifestyle in this unmatched location.” Optima Kierland is located on 9.5 acres at the desirable intersection of Scottsdale Road and Kierland Boulevard. Optima is the Community Designer, Developer and General Contractor, with properties in Arizona and Illinois. Amenities at Optima Kierland take the concept of ‘third places’ to the next level in luxury. Sports and exer­cise facilities include a fully equipped approximately 16,000 square foot indoor/outdoor fitness center, indoor basketball/squash courts and golf sim­ulator. Optima Kierland’s exclusive Sky Deck, with its 360-degree rooftop view, has a heated lap pool, steam and sauna rooms along with spacious common areas and the chance for relaxed social gatherings around sundecks, barbecues, fire pits and a cov­ered outdoor bar. Residents can enjoy a wide variety of entertainment and dining options within convenient, walking distance to Kierland Commons and Scottsdale Quarter, along with a wide range of outdoor recreation to suit diverse lifestyles. Amenities such as floor-to-ceiling windows, Bulthaup or Italian cabinetry, select granite or polished quartz countertops, designer flooring and carpeting, Kohler” fixtures and gourmet Bosch stainless steel appliances with gas stovetops make unique interior design statements throughout each home. Virtual tours, floor plans and interior samples can be viewed at the Optima Kierland Sales Gallery at 15450 N. Scottsdale Road in Scottsdale, open weekdays from 9:00 a.m. to 6:00 p.m., Saturdays from 10:00 a.m. to 5:00 p.m. and Sundays from 10:00 a.m. to 5:00 p.m. Polaris Pacific is managing sales and mar­keting for Optima Kierland. For an appointment, call (480) 418-2630 or visit opti­ma-kierland.com.